Dolls: If your daughter would rather have a GI Joe than a Barbie doll, she might be a tomboy. Sports: If she comes home from school with a football and a helmet instead of pom poms and a cheer megaphone, she is probably a tomboy. Clothes: When your daughter runs and screams at the mention of wearing a dress, she is probably a tomboy! If she has holes in the knees of just about every pair of her jeans and prefers tee shirts, I bet she is a tomboy! 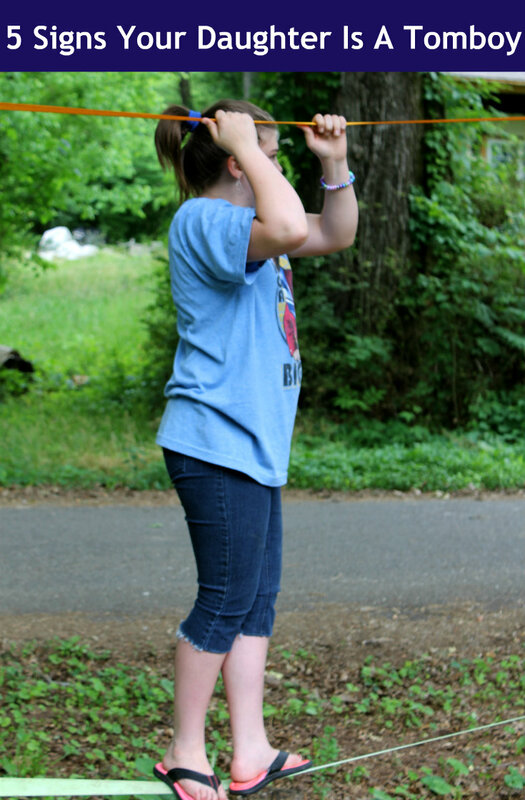 If she would rather have a pony tail and a baseball hat than curls, you probably have yourself a tomboy for a daughter! Activities: If your daughter would rather hang upside down at the playground, roughhouse with the boys or says she wants to be a race car driver like Danica Patrick when she grows up, I am thinking she is a tomboy! Makeup: If your daughter comes home wearing black smudges under her eyes from playing football than from mascara, your daughter is a tomboy! Both of my girls are tomboys and much to my mother’s chagrin, my husband and I celebrate that about them! They love to get dirty, play with the boys and prefer jeans to dresses any day! As I have observed the girls and compared them to myself at that age, I see a level of confidence in them I did not have. I love to see Caitlin when she gets outside and runs circles around the the boys in the neighborhood on her new EXY Trickstartr Stunt Scooter from Yvolution. 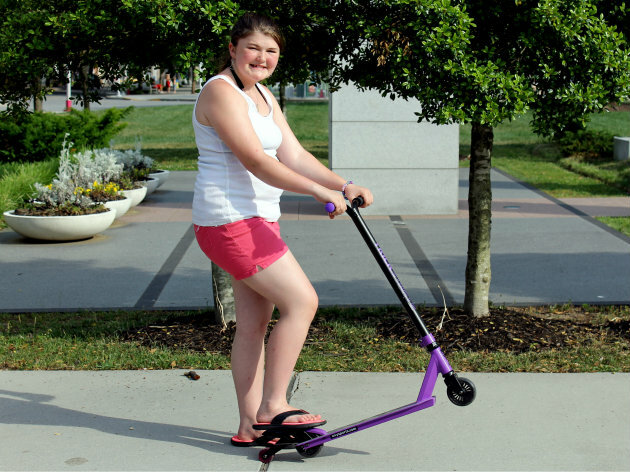 We received this uber cool stunt scooter in purple, but it also comes in green and sells for $64 at retailers like Toys R Us, Amazon and Newegg. This scooter is one of the most fun toys the kids have had in a long time! 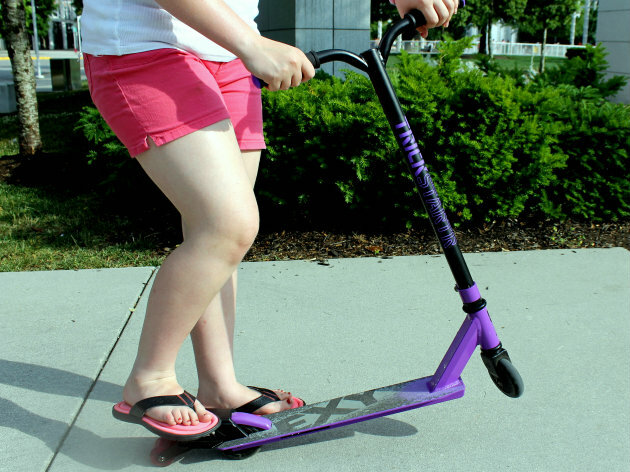 The EXY Trickstartr is a stunt scooter for beginners which will help you learn how to do manuals, which are wheelies. You can also learn many riding styles on the EXY Trickstartr ranging from basic to advanced, of which Caitlin is in between. Each style can help you master how to learn to do a wheelie and do so faster and longer. Once you can do all of the differnet manuals, you can remove the tilt bar, which allows you to go faster and have more agility. We are absolutely taking baby steps in learning all the tricks and stunts and have watched a few videos to help us with that. Here is one video from Toys R Us which lets you see how the EXY Trickstartr performs. I really love how sturdy and well constructed the EXY Trickstartr is. I feel completely safe and comfortable letting the kids ride and do their basic stunts with it. Henry was able to put the EXY Trickstartr together in about 10 minutes with the tools which were provided. The scooter can handle up top 220 pounds, so if I was so inclined, which I am not, I could even do a trick or two! If you are looking for a very good scooter for the kids at a very affordable price, you cannot beat the EXY Trickstartr from Yvolution. One USA reader will win one EXY Trickstartr in their choice of color ARV $64. Is your daughter and tomboy and if so, how does she show it?